After an insane 9 hours of buses on gravity defying mud tracks clinging to the side of cliffs with 500m drops, and the steering breaking on the bus (!!! ), we finally made it back to Pokhara. Felt very weird being back in civilisation! We got to KC's house who had kindly offered to put us at his house for a few days. After some well needed washing, a haircut and shave! We spent the next 2 days exploring pokhara, canoing around the lake, and eating lots of very tasty dal bat that Tulsi prepared for us every night. The Nepali 'green salad' (nothing green in it) and local rakshi was also flowing! KC's children enjoyed practicing their english on us and were full of life! Great kids! After saying a sad farewell to KC and his family, we departed for chitwan national park, joined by Mann and Gunga (another of their friends) as they had been meaning to go there for a holiday for a while. So the 4 of us managed to sort some cheap accomodation and meals very easily (having local contacts is amazing). That afternoon we went on a short jeep safari ride to '10000 lake' seeing some fantastic birds including some huge birds of prey up close. After a fun night of dal bat and lots of gin with the guys, we got up early and jumped into a very very wobbly dugout canoe to cruise down the crocodile infested river. Great fun. After an hour so we got out and headed out on a foot safari with a guide. Climbing through jungle, we both have no idea how the guide knew where to go! Got to see loads of interesting stuff incluyding some mugger crocs up close! There was several exciting moments when we could smell a tiger (they are very strong smelling) but alas it evaded us! In the afternoon after a good fill of chicken dal bat (of course) we took a jeep safari! Saw 4 fantastic rhinos! Such huge animals. The next day Tagadai, our elderly and experienced guide took us for a foot safari up into the chitwan foothills- a huge privilege as barely anyone gets to do it! 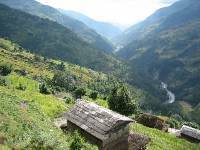 A full days solid trekking , clinbing and weaving through totally unspoilt forest, probably about as wild as you can get! Amazing! An awesome experience that could have been totally different; luckily Tom narrowly escaped certain death in the morning by tangling with a cobra. The next day was a bit of an emotional roller coaster as we said our goodbyes to ganga and mann, the latter of which we had pretty much spent all month with! Pretty darn cool seeing life from a nepaly circle of friends - they're all absolutely top blokes. 9 hour bus journey to kathmandu which was absolutely terrible as is all nepaly public transport. We spent the 27th and the 28th being true tourists in the capital. Checked out a load of side streets and crazy little alleys that litter the city. Of course we also forked out for Durba square which was worth every penny! Really cool and bustly place with temples here, there and everywhere. We made our way to swayambunath (my spelling), a temple on top of a huge hill in downtown kathmandu. From here you could pretty much see every part of town, if you could find a spot which wasn't already taken up by prayer flags! Enjoying our last nights in beds before our full weekend of flying across asia! Nepal has been absolutely epic. There are few other words that fit the bill for describing such a place. The people are so much more genuine and friendly here compared to India and the place doesn't constantly smell like a toilet. The Himalayas is also definitely one of the most beautiful areas in the world - I definitely recommend everyone make a pilgrimage at least once. For a country still finding its feet in the 21st century, it's a truly breathtaking place. We only hope that the authorities can keep tourism under control, keep litter under control and avoid development for.the sake of development and preserve the awesome natural beauty of this amazing little country.